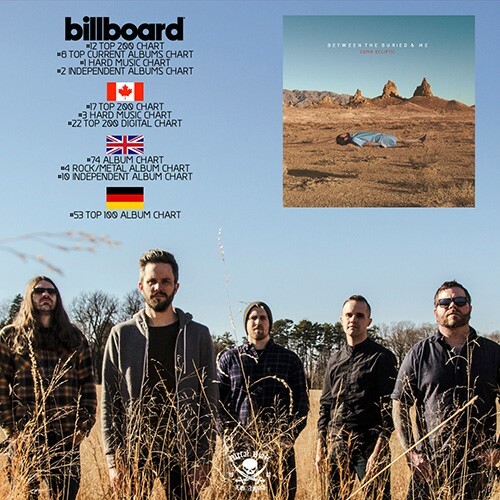 July 21st, 2015 – Progressive metal band Between the Buried and Me have debuted at #1 on the Hard Music Billboard Chart, as well as the iTunes Metal Chart, Vinyl Chart, Amazon Hard Rock Chart, and Amazon Metal Chart, with their latest release Coma Ecliptic. In addition, the album charted on the iTunes Rock chart (#2), Canada Hard Music Chart (#3), UK Rock/Metal chart (#4), UK Independent Chart (#10), Canada Top 200 Chart (#17), Canada Top 200 Digital (#22), Germany Top 100 (#53) and UK Album chart (#74). The album was released on Friday, July 10th via Metal Blade Records. Fans can purchase the album, which Rolling Stone calls “a 68-minute cosmic opera” on iTunes here: http://apple.co/1KU1C66, or purchase a physical copy here: metalblade.com/btbam! Coma Ecliptic is one of the first albums to drop on the new worldwide Friday release day. Between The Buried And Me kicked off a headlining tour with support from Animals as Leaders and The Contortionist earlier this week! Fans can purchase VIP packages that include an exclusive Q&A with both Between the Buried and Me and Animals As Leaders, photo opps with each band, an 18″x24″ poster signed by both bands, and a souvenir laminate with early entrance to the show! These VIP packages are available at showstubs.com/btbam. General tickets can be purchased at metalblade.com/btbam.